It is customary in New Zealand policy circles to assume that older citizens are financially protected by New Zealand Superannuation (NZS) and their high rates of home ownership. Furthermore, it is assumed that families with children are much more at risk of living below one or more of the various poverty thresholds. The evidence supports this belief and there is, of course, an urgent need to address child poverty. However, the status of NZS and home ownership as protective factors for older people in the years ahead is not guaranteed. WALDEGRAVE, Charles. Old and poor or old and cared for? Some policy reflections on data from the first two waves of NZLSA. 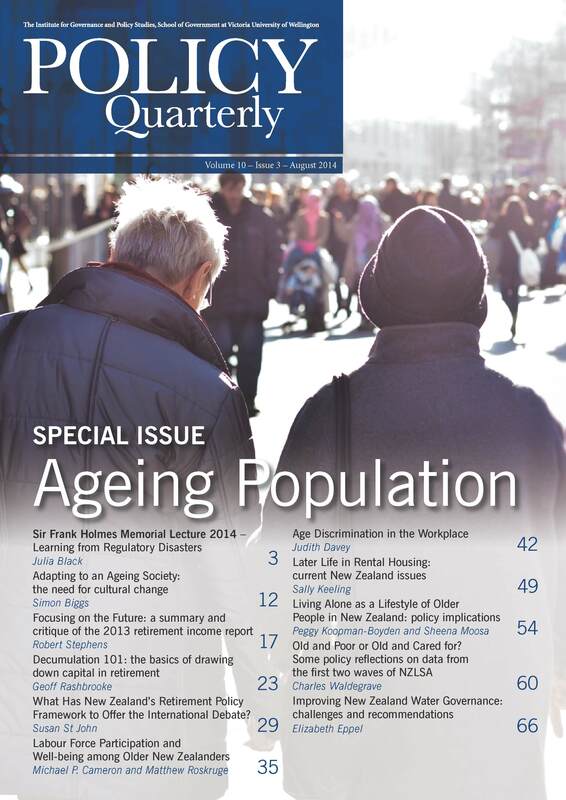 Policy Quarterly, [S.l. ], v. 10, n. 3, aug. 2014. ISSN 2324-1101. Available at: <https://ojs.victoria.ac.nz/pq/article/view/4494>. Date accessed: 21 apr. 2019. doi: https://doi.org/10.26686/pq.v10i3.4494. Permission: In the interest of promoting debate and wider dissemination, the IGPS encourages use of all or part of the articles appearing in PQ, where there is no element of commercial gain. Appropriate acknowledgement of both author and source should be made in all cases. The IGPS retains copyright. Please direct requests for permission to reprint articles from this publication to igps@vuw.ac.nz.